I almost felt guilty walking to the cabinet. I almost felt as if I would get busted, as if someone would burst through the door wagging their finger and raising an eyebrow. Touting me as a phony because am I not “one of those” educators that are supposed to be innovative? One of those that is constantly trying something new and crazy? One of those that tells everyone to just take a chance and make a change? Well I am (sometimes), but I am also human. And on this day I went to the cabinet to fetch an old lesson, something I knew would work, something that I could use again. Something that I would probably tweak to fit my new students, but not majorly overhaul, and honestly I felt relieved. We often confuse great teaching with constant innovation. We think that to reach all of our students in the best way possible, we must constantly change. we must never rest. We must never reuse. Yet, we forget that we are dealing with children that crave routine. Children that yes can be creative and curious but at the same time also need some predictability. Children that can get exhausted when we are constantly trying new things and asking them to discard the old to embrace the new. And let’s not forget about ourselves. The job we have is demanding, and we must constantly search for new solutions, yet we forget to give ourselves a break. There is nothing wrong with using something that has worked before, as long as we make it better each time we use it. There is nothing wrong with trying something we have tried before. There is nothing wrong with pulling out old lessons. 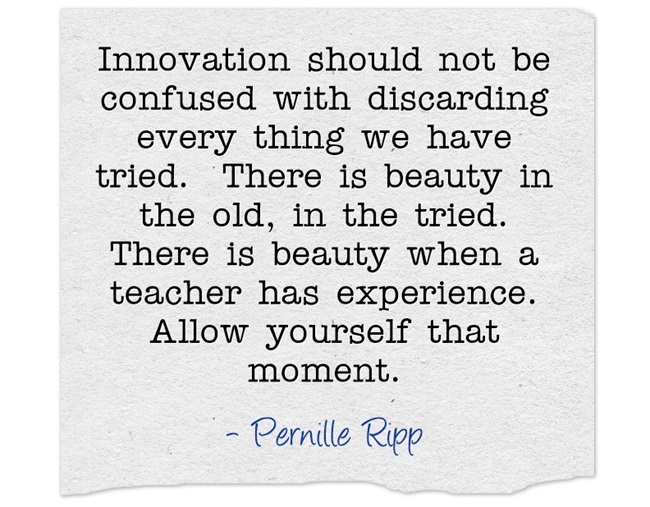 Innovation should not be confused with discarding every thing we have tried. There is beauty in the old, in the tried. There is beauty when a teacher has experience. Allow yourself that moment. So do embrace the old when it works. Fly the flag of your past lessons that have soared. Don’t get stuck, but allow yourself to rest in familiarity as well. Great things come from ideas we have tried on before. Don’t think you have to constantly change to be a change-maker. I like this post, it speaks to me (as do most of your posts). As a first year librarian, I definitely plan on re-using some of my lessons from this year! I have spent many hours (as all educators do) putting together lessons that I feel are relevant and interesting to the students. As you point out, there will be some “tweaking” required, but the base lesson will remain the same.